You know that old saying “Out of sight, out of mind”? Well, that doesn’t work for me when it comes to chocolate. 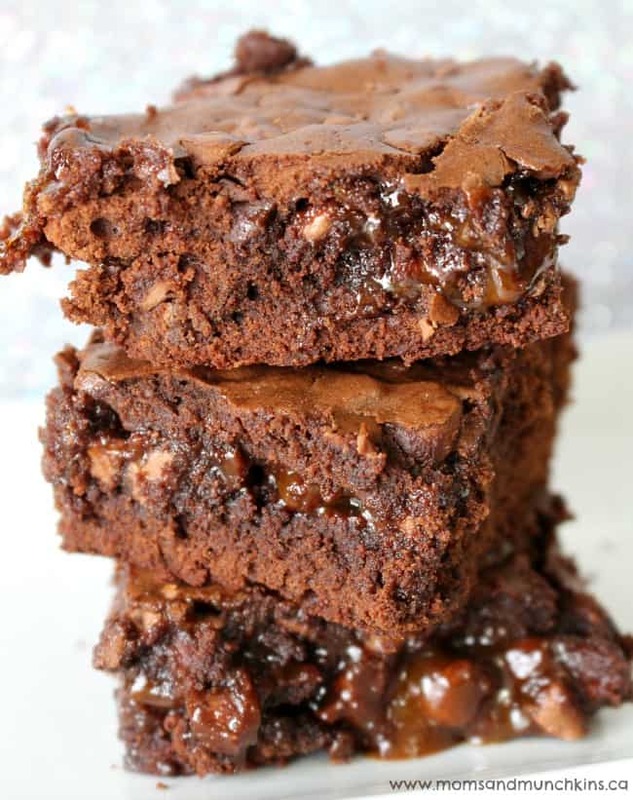 These Chocolate Caramel Brownies looked so delicious that I started digging into the pan before they were cool. Someone has to taste them to make sure they are edible, right? Once I started, I couldn’t stop. My first solution was to put them in the freezer to save them for the holidays. Surely I wouldn’t eat them if they were frozen, right? Wrong. I then had to ask my husband to put them in the trunk of his car so that I couldn’t easily get to them. The plan is for him to take them to his workplace today to share…but I may have been looking for his car keys. If one of your New Year’s resolutions will be leading a healthier lifestyle, then you better make a batch of these before December 31st because they certainly aren’t a health food. Spray a 8-inch square baking pan with cooking non-stick cooking spray. 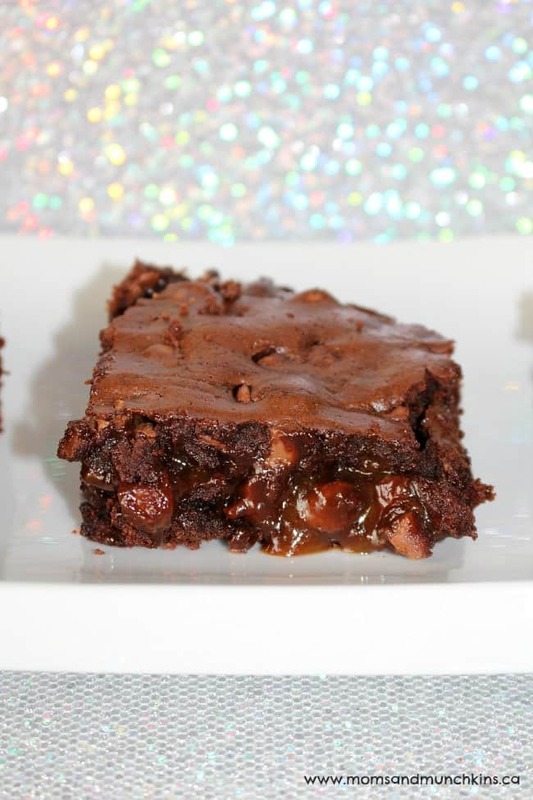 Be generous here because the caramel is sticky. In a medium bowl, combine flour, cocoa and salt. Stir to mix then set aside. In a large bowl, beat butter, sugar and brown sugar until creamy. In the sugar mixture, add two eggs and beat well to mix. Add vanilla extract to sugar mixture and beat well to mix. Gradually add flour mixture to sugar mixture and beat well to mix. Take ¾ cup of the brownie batter out of the bowl and set it aside. Spread the rest of the remaining batter into the prepared pan. 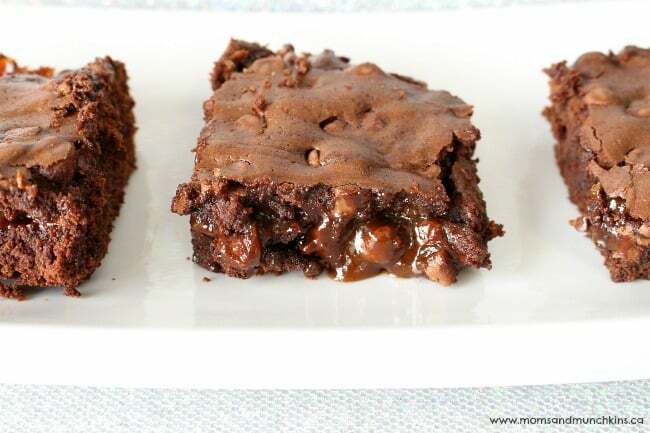 Sprinkle 1 cup of chocolate chips over the brownie mixture in the pan and top evenly with caramel. Beat the remaining brownie batter and an egg in a large bowl until creamy. Stir in the last cup of chocolate chips. Spread remaining batter evenly over caramel topping. These are perfect for baking exchanges, parties or gifts…if you’re willing to share. For more delicious dessert ideas, visit our Party Food & Family Meals page. We’re always adding new ideas. Follow us on Facebook, Twitter, Pinterest, Google + and Bloglovin’ for the latest. Craving more chocolate? 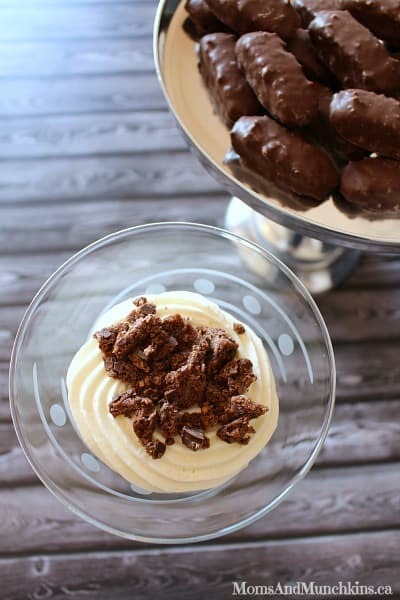 Check out our Chocolate Macaroon Cheesecake Parfaits.